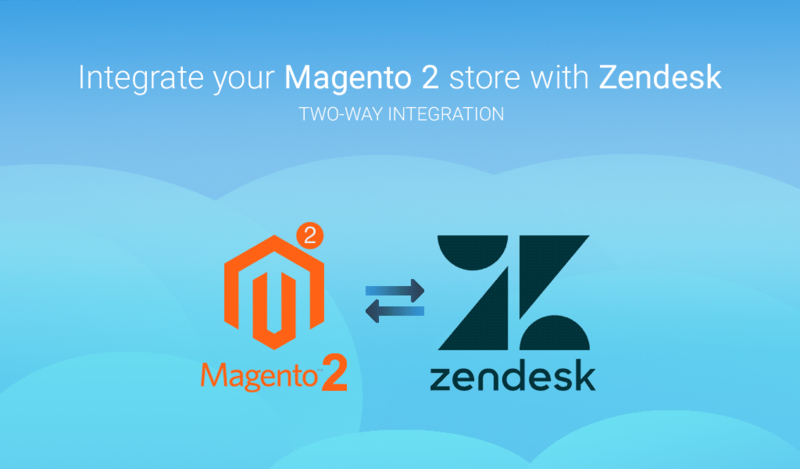 Two-way integration of Magento 2 store and Zendesk Support. 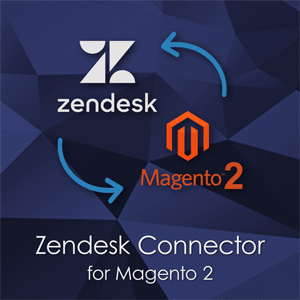 Zendesk Magento 2 Connector extension provides a seamless connection of your Magento store with your Zendesk account. 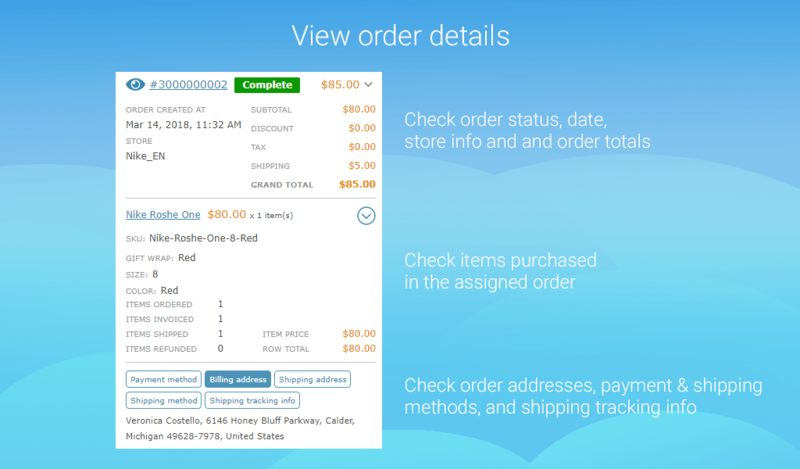 The extension allows displaying essential information (customer groups, recent orders, purchased items, addresses, etc.) in a sidebar of the Zendesk ticket interface. 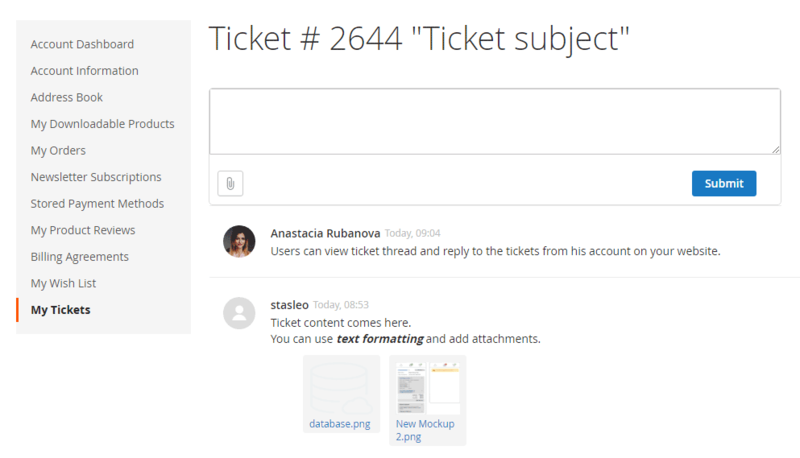 As for Magento 2 side, a customer can create tickets and reply to them from his account. 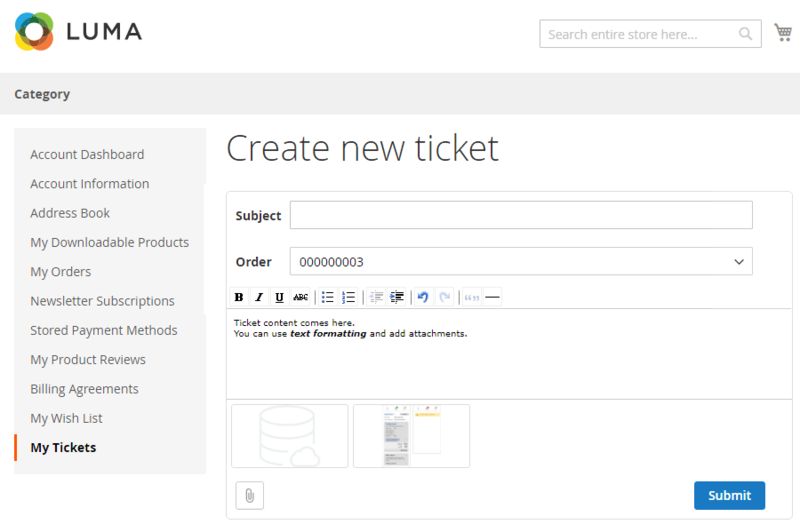 Store admin can view list of tickets on backend customer and order pages, as well as create new ones. Your help desk agents need a lot of additional info to provide a qualified support to your clients: whether a client has an account on your store, customer orders and purchased items, customer group and lifetime value of a client, etc. 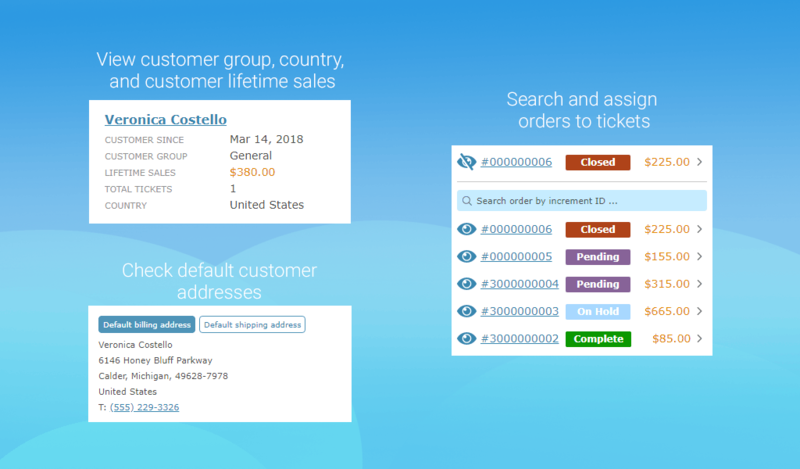 With such an information in mind, support agents have the opportunity to rank tickets according to priority; for example, tickets from loyal customers can be answered first. As a result, agents can decrease average reply time (probably, the most important KPI for support agents), and avoid any possible misunderstanding with ticket reporters. Order items: product name, SKU, product options, item price, Qty and row total; number of purchased items, invoices, shipments, credit memos (refunds) per item. Order information: order totals, date, billing and shipping addresses, payment and shipping methods, and shipping tracking information. Your customers will love the opportunity to create new tickets from a customer account. Surely, customers can use text formatting and attach files. All previous tickets and the ticket threads can be found on My Tickets page. Support of Zendesk SSO (single sing-on) feature over JWT allows your end-users to sign-in into Zendesk to view the tickets. 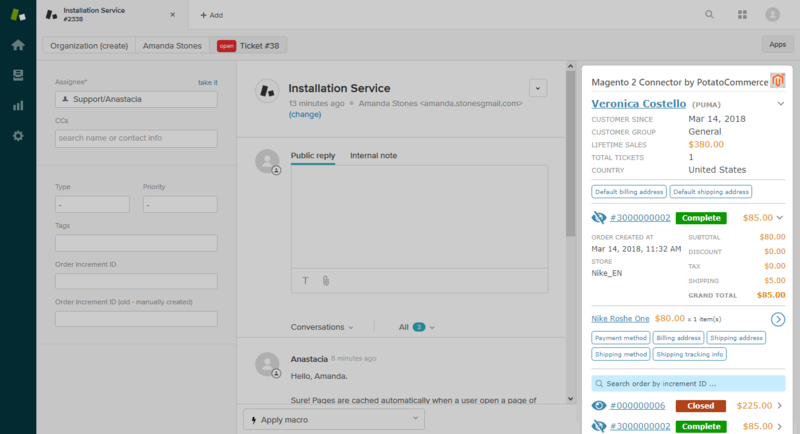 Store admins will love the opportunity to create tickets on support agent behalf from Magento 2 Admin Panel. What is more, list of customer tickets is avialable on backend customer page. Orders can be assigned to tickets. 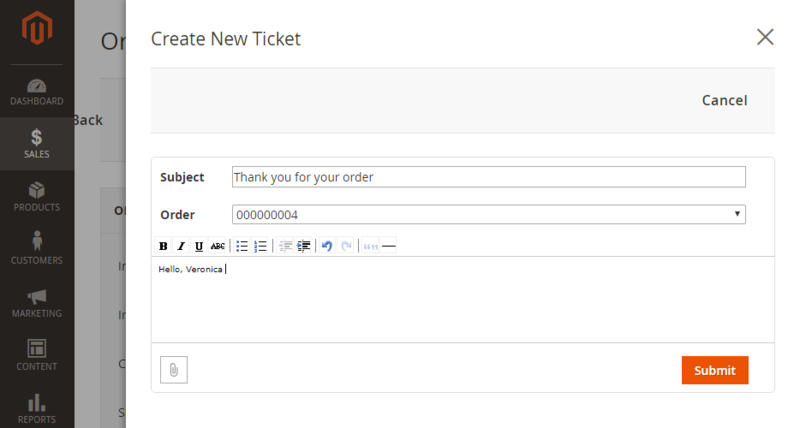 If some order is assigned to a ticket, then the list of all tickets assigned to this order will be displayed on backend order page. One-time payment - No hidden or monthly fees. You can check your Zendesk plan at Zendesk -> Settings -> Subscription. Essential Zendesk Plan does not support Apps. Have an outdated Zendesk plan? Please contact us for a quote. *Important: Zendesk Magento 2 connector is designed to be used with an existing Zendesk account. If you don’t have a Zendesk account, then sign up to Zendesk first. Zendesk is a paid software with a free trial (Zendesk pricing). We are not official representatives of Zendesk company and hereby we do not provide any support on Zendesk itself as it does not relate to the products developed by PotatoCommerce. 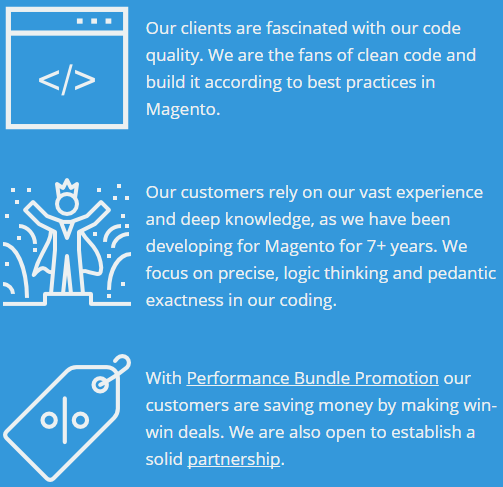 We provide support only on our Zendesk Magento 2 Connector and the functionality related to our product. Zendesk Magento 2 connector extension has no use for people who are not using Zendesk. A comprehensive installation guide is available here. You can contact us to receive an assistance when your order is placed. The installation service is free of charge. 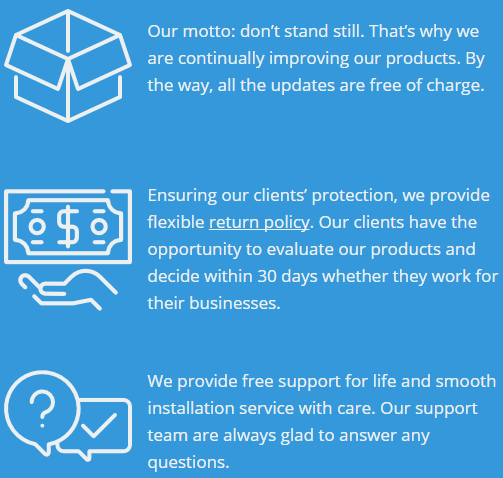 Purchasing the product license you become eligable to recieve free installation assistance, free and lifetime technical and email support, and lifetime product updates. We provide 30 day money back guarantee. Within this period you can receive your money back if Zendesk Magento 2 Connector does not meet your needs. I would like to have an additional functionality. What should I do? We are open to hear our customers’ feedback and requests to consider them all when implementing our new products and new versions of the current extensions. So we will be glad if you contact us regarding your inquiries. Great extension, thanks for connecting Zendesk with Magento 2. Some options to control the details shown in zendesk would be great. I was really impressed by Potato team, very professional and fast support. The code is clean, it complies to Magento 2 development guidelines. High price? Oh come on guys! we pay 400 per month (we have enterprise plan at zendesk), so the price is about our month expenses on zendesk, which is OK for such a great and must have tool. IMPORTANT! Since 1.1.0 version of the product, installation steps have been changed - we have added 'composer require zendesk/zendesk_api_client_php' command to the installation guide. Please remember to run this command during installation or upgrade of the Magento 2 extension. Zendesk Connector 1.2.0 requires update of both extension and the application widget. 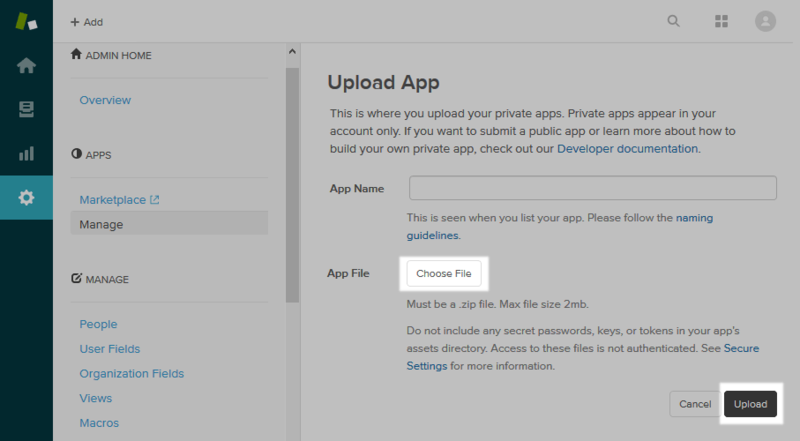 There are two ways to install the widget - manually or via Zendesk Apps Marketplace. Please keep in mind that manual installation of the widget is NOT available on Team Zendesk plan. Store Code - Add here default store code (if 'Add Store Code to URLs' = 'Yes' on your store), or URL subcategory if any (e.g. store.com/subcategory/). Secure Token - Enter the token here. The token can be found in the Magento 2 Admin -> Stores -> Configuration -> POTATOCOMMERCE -> Zendesk -> API Token. Token is used for authorization and secure connection. Need an installation assistance? 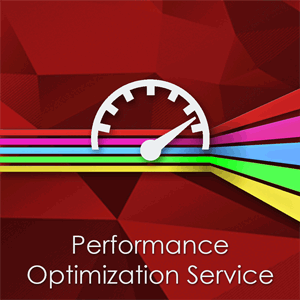 Сontact us and we will be glad to assist with the installation free of charge. API Token - It's used to connect with Zendesk. API Token helps to establish secure connection so to transfer data from Magento platform to Zendesk (like customer information, orders, etc.). API Token should be entered in the Widget settings on Zendesk. Separate information by websites - Support of Multi-Brand feature of Zendesk. In fact, it groups data by Magento websites in the Widget. Don't enable it if your Magento 2 store has only one website. Separate information by stores - Support of Multi-Brand feature of Zendesk. In fact, it groups data by Magento stores in the Widget. Don't enable it if your Magento 2 store has only one store. Agent Email Address - All tickets created from Magento Admin Panel will use this email as ticket requester. Agent Token - It is used to retrieve information from Zendesk on Magento side. For example, it's used to get list of сustomer tickets, to create and update tickets. Zendesk order number field ID - It's used to connect Magento with a field in Zendesk tickets. You can get the field ID here: Zendesk → Admin → Manage → Ticket Fields → Field ID. 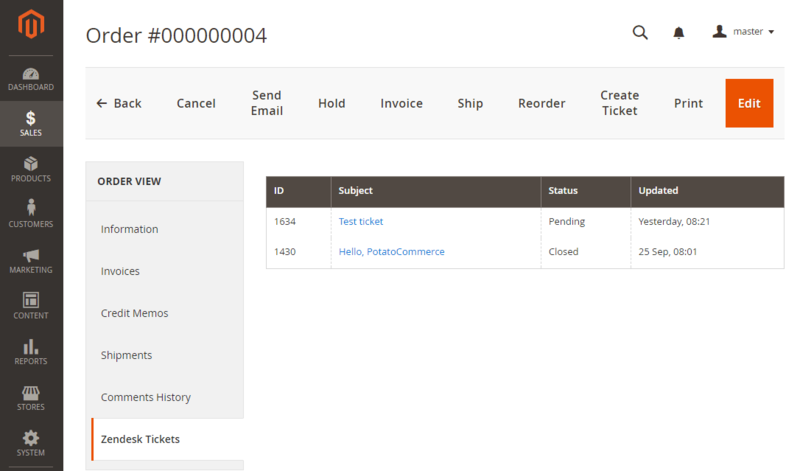 It is used to get Order Number from Zendesk ticket so to display it in a list of tickets on Magento side. 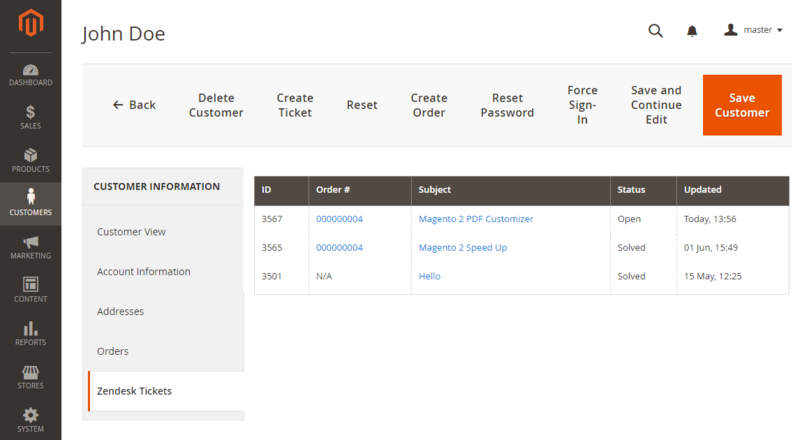 It is also used to set Order Number in the ticket when you create a ticket on Magento side. 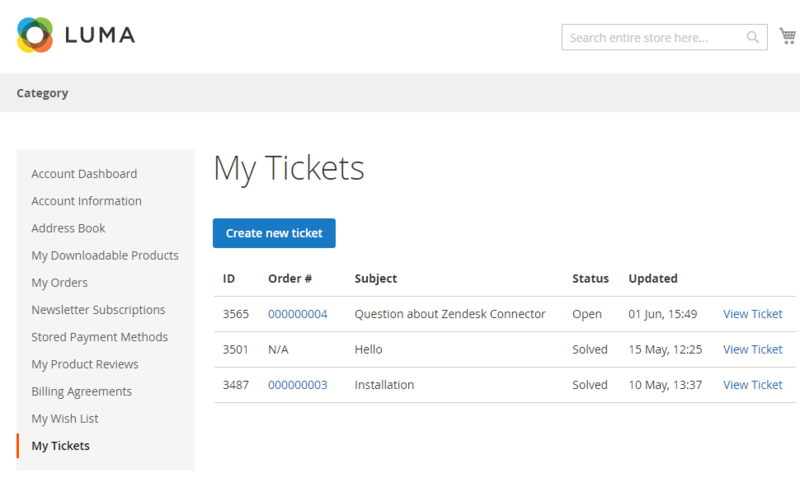 Display tickets on Order View page in admin panel - If enabled, Zendesk Tickets tab will be added to Order page in Magento 2 Admin Panel. It displays all customer tickets which are related to this order. 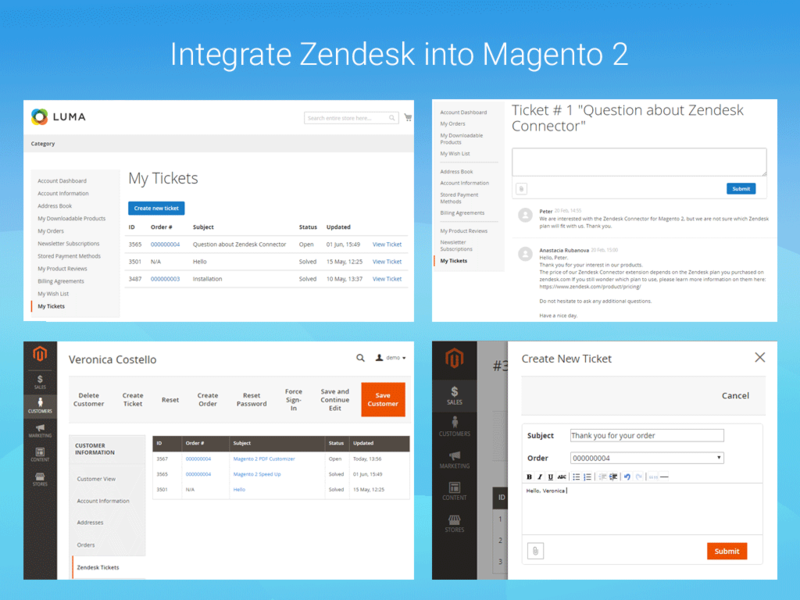 Display tickets on Customer information page in admin panel - If enabled, Zendesk Tickets tab will be added to Customer page in Magento 2 Admin Panel. It displays all customer tickets. Display tickets in My account section on frontend - If enabled, Zendesk Tickets tab will be added to Customer Account page in Magento 2 storefront (frontend). It displays all customer tickets, allows to create tickets as well as to view and reply to existing tickets. Dropdown subject values - Here you can specify pairs of tags and subjects. Tags are not required. Display order field as dropdown - If enabled, you can select customer order from a dropdown. List of customer orders is retrieved by a customer email. If disabled, you can specify any order number in the text field. 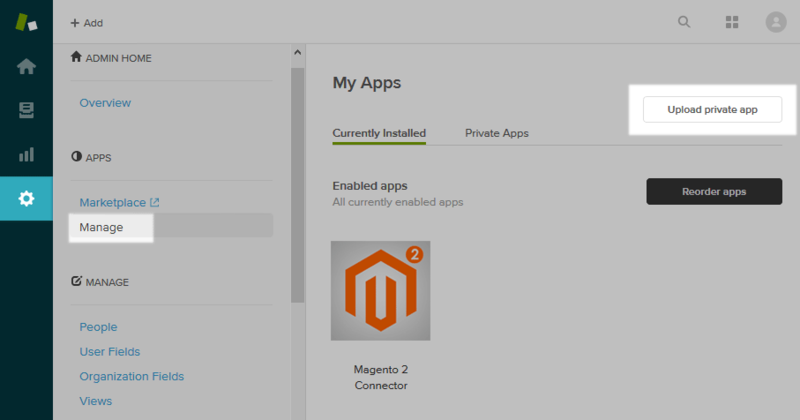 The connector uses SSL (Secure Sockets Layer) technology to guarantee secure connection between Magento 2 and Zendesk. We strongly recommend you to enable SSL on live Magento 2 stores. How to assign an order to a ticket? Add the order number (for example, “10001234”) to the Order ID field of the ticket and save it. Since 1.2.0 version of the product you can also use "watch" ("eye") icon to quickly assign an order to a ticket. We have changed our Zendesk Plan. Should we update the extension license on PotatoCommerce store? Yes, it is required to purchase the extension license each time the Zendesk plan is updated. 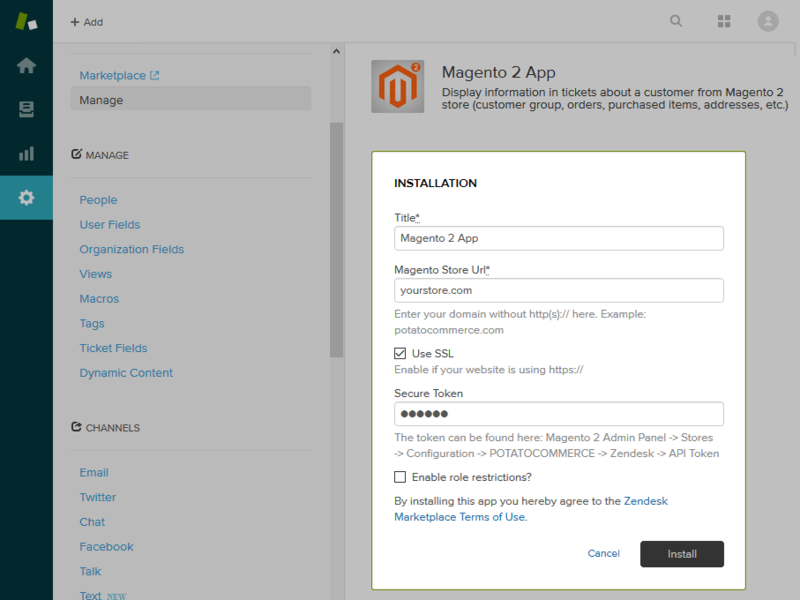 Your Zendesk plan must correspond to the license of Zendesk Magento 2 Connector purchased on Potatocommerce store. Potatocommerce reserves the right to reject all support requests and close customer orders in case of any violation of License Agreement.